Gifts from the Pirates: "I have found that among its other benefits, giving liberates the soul of the giver." This is just a very quick post for anyone out there that wants to donate to a very worthy cause. Mrs M has been working so hard to raise money for our local children's hospital. Making sure that children are looked after properly is something close to our hearts. 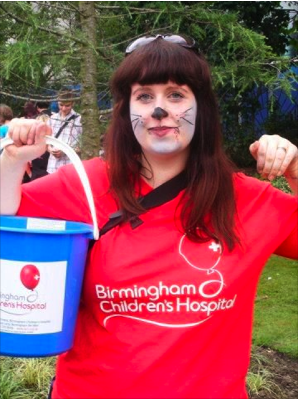 Having a disabled child ourselves we know that sometimes things can be difficult for them and at Birmingham Childrens Hospital they need all the help they can get. If this is something that is important to you then please donate generously and if not then please £1 could still make all the difference. 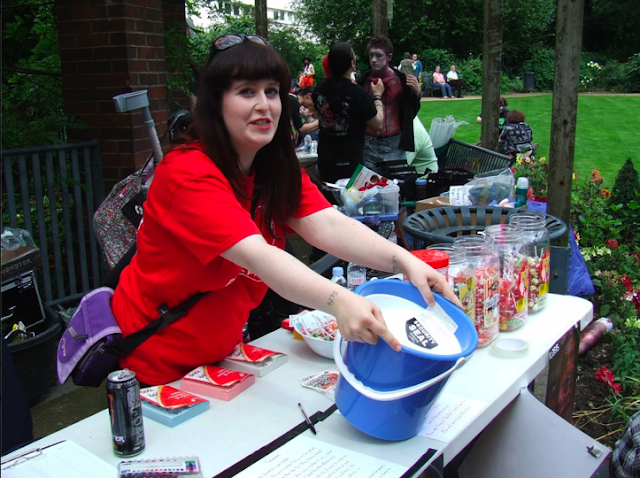 A lot of people were out on Saturday at the Birmingham Zombie Walk doing everything they can to make sure there is a good sum of money going to all those poorly children. so please go to the link at the bottom of this post and it will take you to the donation page. Any amount will be appreciated. I also want to keep this beautiful smile on Mrs M's face. Myself,Opeie and Seth are very proud of her and everything her and everyone else has achieved so far!! !